There was an entire season’s worth of moments in just this one game Sunday afternoon at Target Field. 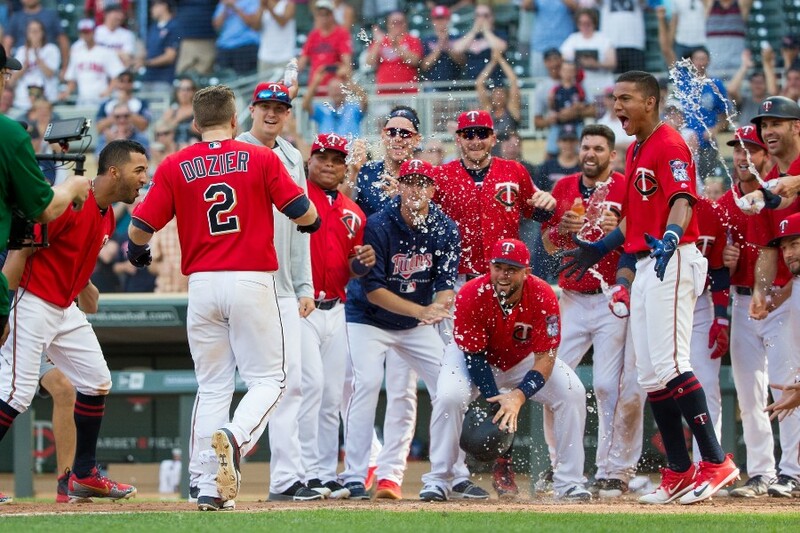 A run scored on a balk, there were two instances in which the benches cleared, the lead changed hands multiple times late and Brian Dozier hit a walk-off grand slam in extra innings. How’s that for a way to finish the first half? There were a lot of noteworthy things that thankfully didn’t end up mattering in the end. Without knowing what really happened it’s difficult to say for sure, but it definitely seemed weird that Escobar was the only player ejected in this one. Both teams cleared the benches twice, but no punches were thrown. It’s still not clear what started the tension, but it appeared as through Tampa Bay took exception to Dozier celebrating a run-scoring balk he drew and as a result they threw a pitch inside to Escobar. We’ll learn more as the details come out, but it would be really strange if the guy who was the target was the only one kicked out of the game. Don’t get me wrong, Eduardo was heated, but it seemed like he had reason to be. After seeing some more video from the Tampa Bay feed, it's obvious that the 101 mph pitch was intended to hit Escobar, and then Rays manager Kevin Cash said, well, some things I can't repeat here. Then in the bottom of the eighth, it appeared from the replays that Jake Cave got his toe on home plate before Tampa catcher Jesus Sucre got the tag on him. That run would have inceased the Twins’ lead to two runs and would have extended the inning. But the original call was out, and that somehow stood even after a review. That out ended the inning, keeping the Minnesota lead at just one run. Paul Molitor decided to use Fernando Rodney to finish out the fifth inning today. That meant it was Trevor Hildenberger’s job to close out the game for the Twins. Hildy blew the lead in the eighth, giving up a two-run double that put the Rays up 6-5, but the bats stormed back in the bottom of that inning to give Trevor a second chance. He blew that as well. Hildenberger gave up the game-tying run in the ninth, ending the day with three earned runs on four hits and a walk over his inning of work. 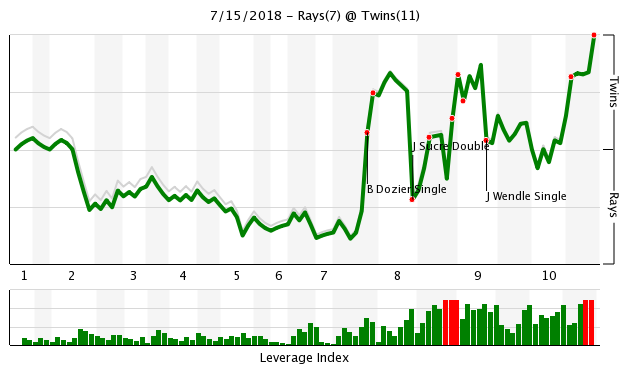 All that really mattered in the end was that Dozier slugged a walk-off grand slam to give the Twins an 11-7 victory. Just the result of this game alone is a positive way to send things into the All-Star break, but the Twins also concluded their homestand with a 9-2 record. Cave hit a leadoff double in the 10th then was bunted over to third by Mitch Garver. Joe Mauer and Eddie Rosario were intentionally walked to set up a potential double play, bringing up Dozier. Rosario had another outstanding game to cap off a great first half. He was 3-for-5 with two RBIs and two runs. He'll have the next four days off, but his .311 average and .890 OPS indicate he should probably be heading out to Washington DC right now. MIN 5, TB 1: Who’s the Snub? Per the post-game show, Rodney needed to leave the stadium by 3:15 because of a citizenship appointment. Sorry, but I have to ask if this is a joke. Seriously. This has to be a joke. Right? Per Molitor's interview, Rodney has an immigration interview in Miami tomorrow morning and needed to catch a flight. They've rescheduled the appointment several times, but were unable to get something better than this. Life happens, and I applaud them for finding a way to still use him for a couple key outs. That is awesome about Rodney's reason for pitching early. I mean, in a storytelling, makes you think kind of way. Especially (toes the line tentatively) in these days of immigration...issues. Maybe this will give Molitor some inspiration. And apologies to Yarniveck, if you read this. You sniffed this(or at least something) out in the game thread--touche. "Earlier today the baseball world loved what Molitor did when he brought in Rodney to get two huge outs in the fifth. So what was the thinking in this genius strategical decision? Molitor: Fernando had an immigration hearing in Miami and had to leave just after 3 p.m."
Obviously, Hildy didn't do his job, but then again, your guy MOY probably left him in too long. Meanwhile, Matt Magill heads into the All-Star beak with five days of rest. That last sentence, that's what irritates me even more than who is used when. It's who is used how often over someone not being used at all. Why are they there then? This more than anything makes me ride the 'not a fan' of MoY bus. One wonders how the game would have gone if Magill had come in after Rodney to start the 6th instead of Ryan Pressly. We may also never know how good or how bad Matt Magill is if he never gets into a game. If Rodney had to leave early, I probably would have had him pitch the first inning and brought Romero in to start the second. I'm not sure a strategy like this has ever been tried. The league might fine Molitor for such shenanigans. That would have been a viable option. But doing so would have also put two guys into situations they aren't used to -- Rodney starting, and Romero coming into a game when he doesn't know exactly when he'll be used. Starters are creatures of habit, and I'm not sure it's fair to a rookie with less than 10 MLB starts to have to guess at the +/-10 minutes of when the second inning will roll around. In addition, with a rookie, there's a reasonable likelihood that he's going to need to be replaced mid-inning. Though that's not the primary way Rodney's been used, he's certainly been there before. And if Romero doesn't need to be replaced mid-inning, there's a good likelihood that he pitched a nice spiffy 5 or 6 quick innings. So yeah, using Rodney as the "opener" would have also made sense, but I think this was a good approach. On Magill, I get the love based on the way he started, but he's also given up 11 runs in his last 11.2 innings going back to June 21, with at least a run in all six games. The way today was going, I didn't mind not seeing him in such a tight game. Magill is out of options. I suppose he could clear waivers, but it's not so easy to shuttle him between Minnesota and Rochester. However, I don't think the criticism is about using Magill, per se. It's more like, if we're not going to use him, why do we keep him? The rest of our pen isn't good enough to support that. I think I'd rather use Magill's spot to rotate through Moya, Curtiss, Duffey, etc. Maybe even break in a AAA starter. I found time to gather some video on the benches-clearing incident and the Cave out call at the plate. The article has been updated. Crazy stuff, what a wild game. Cash should get fined/suspended, he incited the whole thing, not Escobar, and the video reviewer in New York should be fired. I don't understand how they couldn't get that call right on replay. Even the Rays catcher when he was watching on the video board seemed to acknowledge that the call was more than likely going to be overturned. Both bullpens running in when the benches cleared was funny. Weird funny but also haha funny. I'm sad I missed this game. Thanks -- I missed that Magill is out of options. But if I look at his game logs, it doesn't seem like his usage is that out of line. His days off pattern the last few weeks has been 4-1-5-1-6-1. The long rests have come on the heels of long outings -- 34, 60, and 45 pitches. He's also in a tough spot. In those six appearances, he's come in in the 2nd three times and 4th or 5th twice. That's a hard role to predict, because the manager is in a constant state of "I'd rather not use him today in case I'm going to need him early tomorrow." Somebody's got to be that guy, and it looks like it's Magill right now. Somebody will probably say, "As long as Belisle is around, why isn't he that guy?" Frankly, over the last few weeks, Belisle has been more effective than Magill. Though Belisle sucked yesterday, he was actually unscored on in the previous five outings. He's either been horrible or pretty good since coming over, but even his three horrible outings all came in the 8th or 9th when they were already down at least three. If the game had been closer, he probably wouldn't have lasted long enough to give up five runs like yesterday. Don't interpret my comments as being down on Magill -- he clearly had some top-notch outings that kept us in games. Perhaps, based on his lack of effectiveness recently, rather than trying to send him to Rochester, they should have considered a DL stint. And here's a wondering on Magill. They didn't name Romero as today's starter until after yesterday's game. That sounds like it could have been Plan B. I could easily see Plan A as having been seeing today as a bullpen game, with a good likelihood of a Magill sighting. But they shot that possibility with so much bullpen usage Friday and Saturday, so it was Romero's start and then play the rest of the game with the guy Molitor thought gave them the best chance of winning. He wasn't ready to go to Magill first, but at one point he appeared to be the next up. It feels really good to be mad at the other team for a change, lol. One more update: The Twins apparently didn't challenge that Cave was safe, per @MLBReplays, they were challenging that catcher Jesus Sucre blocked the plate. 1) That's embarrassing for the Twins/Molitor. 2) It's embarrassing for MLB to have such a ridiculous review system. Why can't you simply review whether or not the call was right? Why so specific? It's trash. I was at the game. Great game to watch, but not some kind of masterpiece. Probably the right call to pass both Mauer and Rosario, but Dozier had to have some extra incentive at that point. As far as the Cave play, his foot went across the plate before he was tagged, but the replays didn’t show clearly when any part of his foot touched the plate. I took my 3 year old son to his first game today. He did pretty well until about the 8th inning (which was over 3:10 from first pitch) so we left after the Twins gave up the lead. Heard them take it back on the radio, then I got home just in time to see them blow the lead in the 9th, then Dozier's slam. Would've been great to see the slam in person, but 4.5 hrs for a ten inning game just ain't happening for a 3 year old. Glad they could pull this one out- would've been a shame to let it slip away as much as they battled. Yeah, I thought I saw Cash mouthing off from the bench. That's bush league crap and managers shouldn't be lipping off like Cash was. And if Cash called for that pitch at Escobar, that's a bunch of crap. Good grief, it's almost like Molitor got a win despite his best efforts. Similarly, it looked like Escobar's verbal response after the strikeout was in response to one of their defenders mouthing off. If they were rostering guys with options, though, they wouldn't have to worry about that. For example, Moya throws 40 pitches, and the rest of the pen is taxed too? Option him for Duffey. Or a AAA starter. Then rinse and repeat. I don't think our pen is good enough or deep enough to hold a non-optionable guy in reserve all the time, and I'm also not sure Magill is good enough or has enough potential to warrant that kind of investment in him either.